Todd Tucker has a suggestion on how to keep the family peace for his housewife Kandi Burruss. 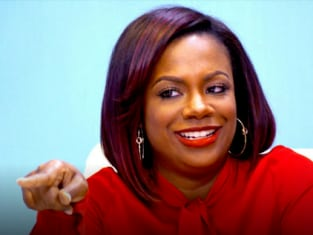 It will probably involve his patented approach of confronting the issue, which we know by now Kandi isn't a fan of doing. Let's check out The Real Housewives of Atlanta Season 7 Episode 8 to find out his grand plan for halting all their Mama Drama. Phaedra's meeting her mother Pastor Regina for breakfast to talk about her issues with Apollo. His appearance at Demetria McKinney's video release party left her shaken. He professed his love to her at the party but both Phaedra and her mother say his actions show something different. He's not talking to her at home unless he's blaming his legal troubles on her, but the biggest concern she has is that he doesn't seem to care that he's leaving his children behind for 10 years in prison. Get with it, Apollo. Minus 30. NeNe to the hostess: "I'm meeting a girl with a lot of weave in her hair..." Plus 20. She and Porsha catch up and talk about Demetria's video release party that didn't actually feature a video. When Porsha asks NeNe about Cynthia, NeNe decides that she, Cynthia, Porsha, and Kenya need to sit down for drinks since they're the women having the most issues with one another right now. Aunt Nora brings up Kandi's trip to New York and her dinner with Mama Sharon which makes Mama Joyce try to hide behind her solo cup. Minus 5. Cynthia takes Claudia to The J Spot, Derek J's salon, for the full treatment. Apparently Cynthia doesn't think Claudia has enough game to be living in Atlanta. I can't really tell what's going on with them. Does Cynthia really take issue with Claudia's get up and go routine in the morning? Or is she just joking? That was weird. Kenya Moore is looking for office space. Her company has been writing, producing, directing, and all that "for a very long time" but they've never had an office space before? Or just not an office space in Atlanta? What? Minus 10. She's putting all her eggs into the Roger Bobb basket. This is going to backfire. Claudia's mom and grandmother are in town for a visit. Her grandmother and her mother don't exactly get along, so this will be fun. After they eat their snail salad. Barf. Kandi's nervous about ticket sales for her show and stressed about the fact that they haven't even sold out half the seats in the theaters. She wants to take her mom and aunts on the road and Todd's not on board. He's even less amenable to the idea when he finds out Mama Joyce won't apologize. His big plan for their family is that he'll spend his holidays in New York with his mother and she can stay in Atlanta with hers. Minus 30. That's terrible, Todd. Terrible. At least he's honest when he says he doesn't want to be around her mother for the holidays. Plus 4. Claudia takes Grandmother Lillian and Mother Teresa to a drag queen restaurant to push them outside their comfort zones. When they toast, Grandmother Lillian says she loves Claudia to death and Claudia points out to Mother Teresa that they've never said "I love you." Mother Teresa still doesn't say it. "Action matters more." Ouch. Phaedra's pretty sure nothing much will change once Apollo is in prison since she'll still be a strong mother for them then just like she is now. It's a really touching moment and he totally misses it. Minus 10. NeNe and Porsha show up to lunch first and NeNe drops the news that Cynthia is bringing Kenya to the occasion. Kenya immediately throws shade at Porsha. Once they have a round of drinks and Kenya throws more shade at the fact that they're up in Duluth, NeNe and Cynthia both get annoyed with the fact that Kenya keeps butting in and finally Cynthia tells her to stop. Kenya and Porsha both get up and go to the restroom leaving Cynthia and NeNe to talk alone as it should have been all the time. When Kenya gets back from the restroom, she suggests Cynthia and NeNe go to lunch alone together and NeNe says maybe in a couple of years they'll do that. They joke around a little and NeNe looks very uncomfortable. Plus 4. NeNe opens the forum for Cynthia and Porsha to address their issues and while they do that, she refills everyone's vodka tonics. Cynthia finally gets her apology from Porsha for Porsha's tardiness at lunch and then they start talking over each other while NeNe shouts Porsha's name and Kenya shouts Cynthia's and then Porsha snaps on Kenya calling her "rude as a motherf**ker." Probably should've gone with "drunk as a motherf**ker" but hey, rude works. Cynthia and Porsha just decide to squash their differences. Then NeNe asks if Kenya and Porsha can do the same with their issues. Kenya tells NeNe that things happened between the two of them that she's moved past. Porsha acknowledges that she made poor choices but doesn't apologize for them. Kenya just gets up and they hug it out. Well, Kenya hugs it out. Porsha rolls her eyes as soon as Kenya walks away. The manager comes over to ask them if they've had a good time at the Arena Tavern which seems to be code for "STFU. GTFO." Next week we'll see just how good NeNe Leakes is at brokering peace agreements. If you missed a minute of tonight's drama, remember you can always watch The Real Housewives of Atlanta online.